The Insta360 One X debuted on October 10th, but already it is garnering top awards. The Consumer Electronics Show held yearly in Las Vegas was awarded the prestigious CES2019 Innovation Award Honoree in the in the Digital Imaging / Photography category. And, in October, the Pro 2 was chosen as the Best 360 Camera at the prestigious Lucie Technical Awards, while the ONE X picked up the Best of Show Award at the Visual 1st Conference. This quite an accomplishment especially considering that the company has only been around for four years. 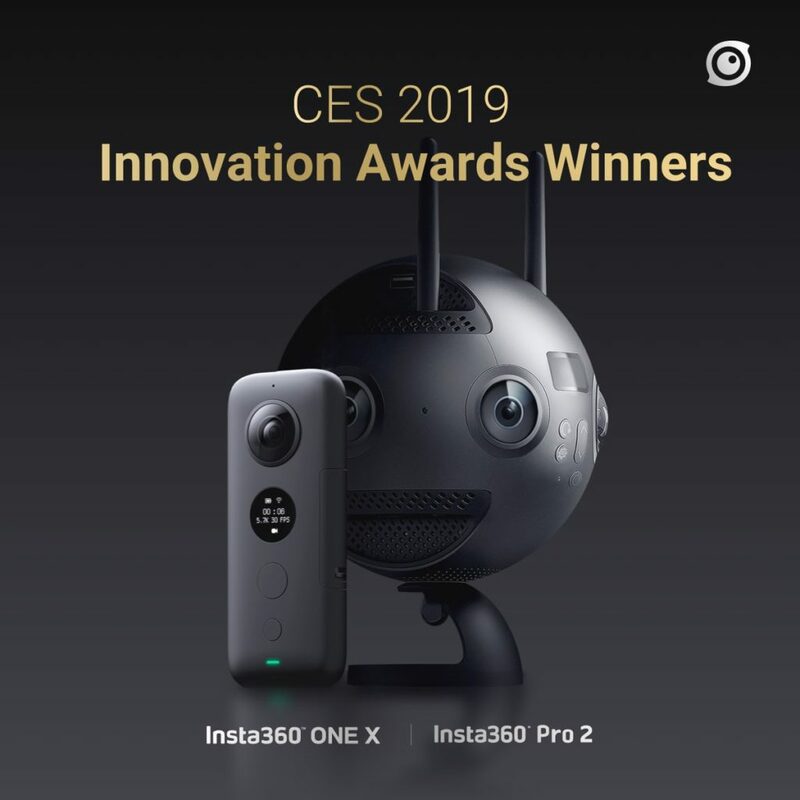 For the last three years, Insta360 has won an award from CES for their cameras. Let’s examine why the Insta360 One X deserves this platitude. First, let’s look at the specs. Box Dimensions (LxWxH) 9.15 x 4.8 x 2.55″Now let’s do a deep dive to talk about how easy this camera is to work with. The iOS and Android apps are beautifully designed and executed for the opening splash screen onwards. The moment you open the app, you are greeted with incentives to publish your work as you view other creators works. This not only encourages you to be a part of the community but also offers up a great way to get new ideas for your videos. Next, connecting your camera is a smooth and easy operation. Simply click the yellow icon and select either connect via supplied USB cable or connect via wifi. Connect via wifi lets you choose to “connect now.” From there a step by step tutorial not only shows you but guides you through the painless connection process. The WiFi connection process is the standard by which all other camera makers need to emulate. Once you’re connected is when the fun begins. The smartphone app is the springboard for your creativity with this 360 camera. The app is now quite developed with the latest addition of HDR video. I will be covering HDR video in another review. One of the big selling features is to be able to “Shoot first, point later.” This is a lot more than a marketing catchphrase, it really works. 360 cameras are finding appeal as the new action cam replacing things small 2D action cameras with the more versatile Insta360 One X. with this you never have to miss a shot, and if you like, you can create 2D images or video right in your phone. The editing and effects are second to none in phone-based systems. With five beauty levels for smoothing skin, you can make everyone look like Hollywood stars. Along with that, you have a choice of nine filters, and a plethora of stickers. From each shot, you can create a Perspective, Fisheye, Tiny Planet, and Crystal Ball which can export to the Insta360 community, WhatsApp, Instagram, YouTube, a link, or saving locally to your phone. But your choices don’t stop there. You can create a 360 image photo or video, or a Spin View video animation. As for videos, the same options apply, beautify, add filters, and multiple export locations, but you can also trim, add music, speed up and slow down, as well as add pivot points ( which directs the video to look where you want it to. You can even and smart track persons or objects. These are powerful editing options that would otherwise require your computer but are easily accessible on your phone. Videos can be exported locally as fixed frames (with whatever editing angles and features you chose) and the original 360 videos. Aspect ratios can be adjusted as well with options for 9:16 (for portrait phone view), 1:1 square video, classic 16:9 view, or Perspective 360 view. You can manually control shutter speed and ISO, and control exposure compensation. You have a built-in 6-axis gyroscopic stabilization, which Insta360 has dubbed Flow-State, giving you that beautiful near gimbal experience. Insta360 can also capture “Bullet Time” videos, where you spin the camera with a rope or Insta360’s special handle, and the video focuses on you being the center point. Think of that famous Matrix bullet scene, and it’s somewhat similar. These also offer options for speeding up and trimming, plus exporting. A TimeShift feature allows you to adjust the speed of any part of a clip any way you want. You can speed walking scenes like a timelapse then prolong dramatic scenes with slow-mo. You have a documentary film kit, with you in control of everything. Yet another cool feature is that now the Insta360 One X is integrated into Goole Maps Street View. So you can view and then upload directly to Street View via the One X mobile app. The app will also convert video into evenly spaced 360 photo spheres for viewing on the Google platform. Buttons are simple and easy to reach with one hand. The display is good except when you are in the bright sun, but the phone can take care of anything for you, so it’s not a big deal. There are a couple of types of Selfie sticks. There is the Invisible Selfie Stick which is used with the Bullet Time Accessory. I like this better for Bullet time than using the string that comes with the camera. It just feels more secure to me. 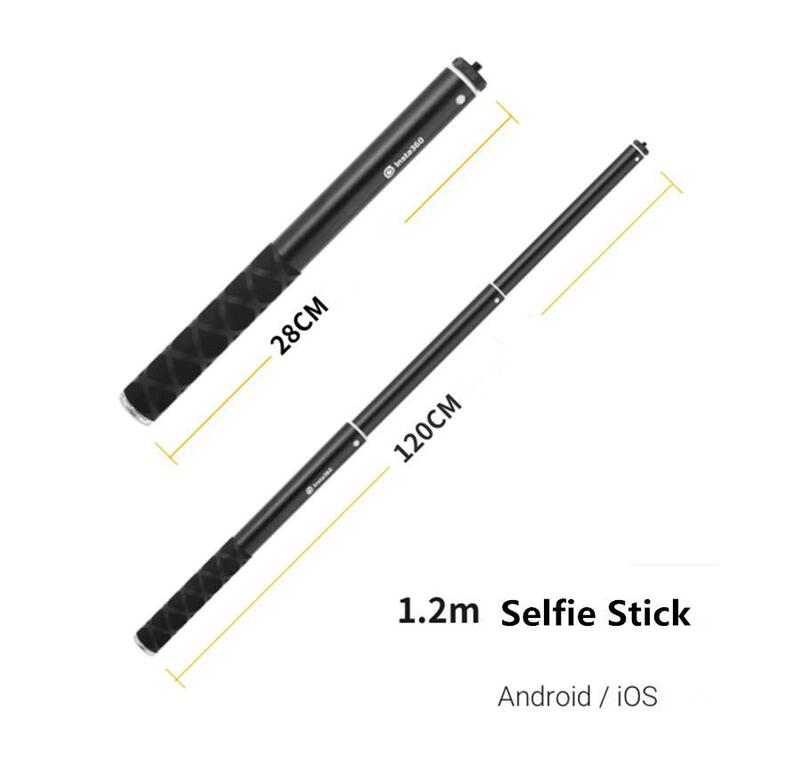 Then there is the Extended Edition Selfie Stick which extends from 0.58 meters to 3 meters for some very cool aerial shots. This is also great for making Tiny Planets. While the camera is not waterproof, Insta360 offers a choice of two waterproof housings. The Venture case is waterproof to 6 meters and is great for surface water shots and places where your Insta360 One X might get wet. 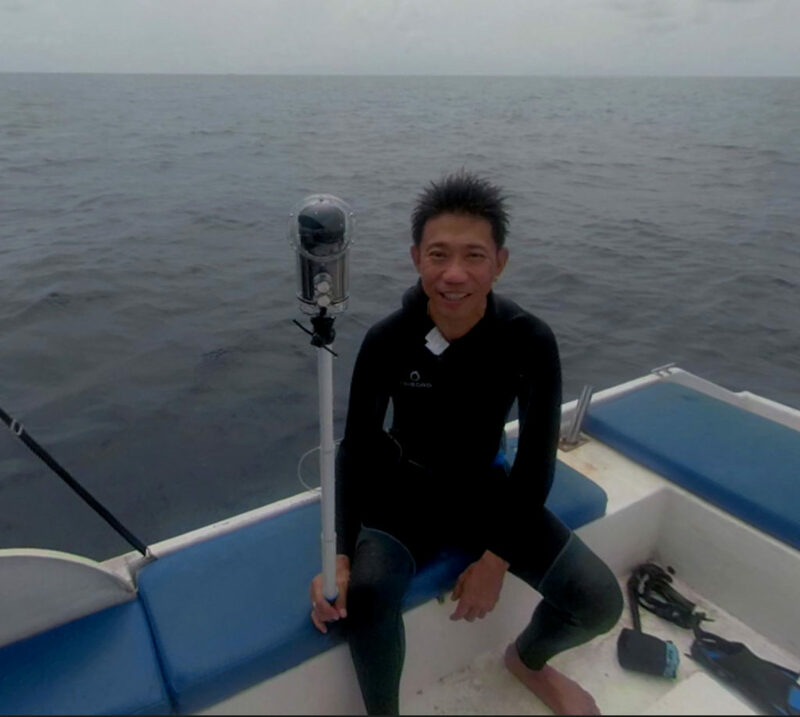 The second is the full-on Underwater Housing, the Dive Case is rated to 30 meters, and I have tested it to 32 meters with no problems. You can get some spectacular video underwater with this housing. I’ll have a full report on this feature very soon. Both the Venture Case and the Dive Case have special stitch settings for above the water and below the water and the stitching is great. One of the other features that I really like is the Removable battery. While many other 360 camera makers have chosen to make the battery internal, I believe the best way to go is to be able to pull a discharged battery out and pop in afresh fully charged battery. Not everything is rosy; there are some features that could stand some improvement. The supplied USB camera to phone cable for live streaming is too short. That said, you can always get a longer “L” shaped USB micro cable on Amazon. Speaking of micro USB, with the changeover to USB-C, I wonder what was Insta360 thinking by sticking with the older USB micro cable? On a good note, there are lots of cables supplied for both iOS and Android. Thankfully, these are relatively minor issues that should not change your mind about this camera. Overall, the video looks great, the stills are marvelous, and the camera is light enough to hang around your neck with the supplied lanyard and camera pouch. 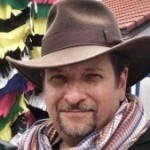 It works equally well with or without the smartphone app and the Computer software, while initially delayed, is catching up nicely. This is definitely the right camera for everyone from action enthusiast to family get-togethers. The Insta360 One X is the best consumer 360 on the market for those who want an easy to use smartphone-based system for shooting both 360 and 2d pictures and videos. Please help me out, and if you are going to buy an Insta360 One X or any Insta 360 camera or accessory, please do so by clicking the links below. I make a small commission, and you get some extra free goodies!